David, Sean and Pat, travelled all over Melbourne to watch the Roys at whatever their ‘home ground’ was at the time. Pat and Ward Leydon have followed Fitzroy through thick and thin all their lives: from ground to ground, in good times and in bad, against all odds. For them and their children, David and Kelly, and David and Kelly’s kids – following the Lions is a family thing. It’s something they’ve always done, and will always do. So when the first bum deal was dealt the Roys and they were moved off the grand old Brunswick Street Oval in 1966 to become the refugees of the VFL/AFL, it was a wrench. But not one to bemoan their fate, or that of their beloved Roys, Pat and Ward simply changed routes and travelled further afield to watch them every week, rain, hail or shine. David tells us that Pat first started going to Fitzroy games at Brunswick Street Oval in the late 1940s. She was Pat Ryan back in those days. “She and her sister Doreen would always stand behind the goals at the Brunswick Street end. That way they could run out of the ground at the end of the game and get a seat on the waiting tram,” says David. Pat was in the crowd when Fitzroy captain Alan Ruthven kicked the winning point in the dying seconds of the 1952 semi-final against Carlton. She was there to see Vic Chanter keep legendary Essendon full-forward John Coleman goalless for the only time in his career. She was there when Kevin Murray played his first game and 20 years later, was there to see him play his final 330rd game. She was there in the pouring rain at the ’86 elimination final against Essendon when Micky Conlan kicked that last-minute goal to beat Essendon – one of her greatest days as a Roys supporter. And Pat and Doreen were in the crowd on that sad day in 1996 when the Royboys played their last AFL game in Melbourne. Words aren’t necessary to explain what this felt like for Pat and Doreen. Their faces say it all. Pat Leydon and sister Doreen express the deep distress all Fitzroy supporters felt on the last day the Roys played in the AFL in Melbourne. Of all the family, Ward was probably the most affected, finding it very hard to accept what had happened. 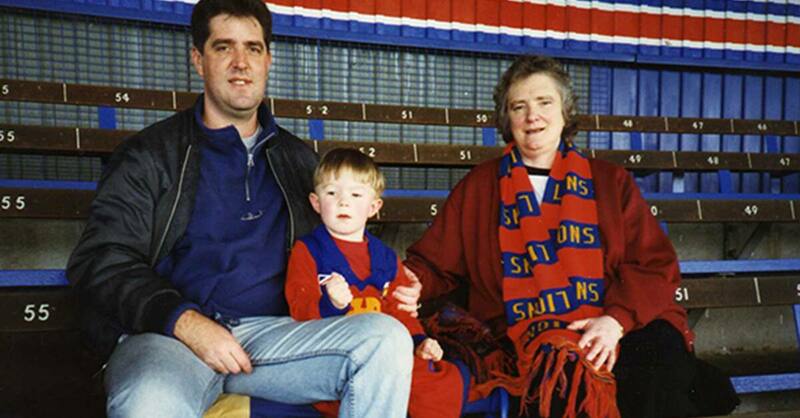 While the whole Leydon family played their part over the years in fundraising attempts to keep Fitzroy afloat, Ward went to the extent of taking long service leave in 1991 to work on the fundraising appeal conducted by the club from AFL House. He worked there all day, tag-teaming with David who came in at night to volunteer on the phones with other passionate Roys supporters. It was a little different, and perhaps a little easier for Pat, and she embraced the Brisbane Lions concept pretty early in the piece. David thinks much of this was due to Pat’s pivotal position as a Lions’ matriarch and organiser of family football allegiance. After all, she was over the moon when her first grandson Sean was born in 1992 and accompanied him to his first Royboys’ game as a 2-year old. Sean Leydon, 20 months old, with Paul Roos in 1994. How could a grandmother countenance her first-born grandchild living without an AFL team to follow? So, in time, Pat also became a passionate member of the Brisbane Lions and was ecstatic when they won three premierships in a row in 2001, 2002 and 2003. David, like his father, was at first angry, and then lost, after 1996. “Even after the first couple of premierships which were great, there was something lacking,” says David. “We yelled, screamed and supported our backsides off in those two grand finals and we were rapt to finally have some success. “But to me, deep inside, something still didn’t make it feel 100 per cent like old Fitzroy. This was Round 19, 2003 when the Brisbane Lions played Collingwood at the MCG. “It was heritage round,” David recalls, “and for the first time the Brisbane Lions wore the old Fitzroy jumper with the traditional white FFC on the front. They looked magnificent! “The Lions won and as the players walked around the ground waving to supporters after the game, Jonathan Brown and Michael Voss tapped their hearts and pointed to the FFC on the jumper. Michael Voss proudly shows off the heritage guernsey during Round 19 v Collingwood, 2003. For David and all the Leydons, the fact that they now have the opportunity to come to the great old Fitzroy home at Brunswick Street Oval every winter is icing on the cake. Sean Leydon with hero Michael Voss in 2003. “A thousand passionate emotions are stirred every home game,” says David. As for Pat, now in her 80s and wheelchair-bound, she remains a proud, passionate and paid up member of the Fitzroy VAFA team and derives much pride in the fact that her husband, sister, son and grandson are too. She demands to know the quarter-by-quarter Fitzroy VAFA scores from David and is always rapt to hear of their wins and confident in their ability to resurface after a loss. She absolutely loves the fact that women are now enjoying on-field prominence and recognition in AFL circles, recently telling David that if the AFLW had of been around 60 years ago she’d definitely have got a game for Fitzroy and have liked to play against and beat those Collingwood girls! She is very pleased to know that the Roys have a women’s team in the VAFA and likes to know that Gemma Minuz and her crew are serving it up to the opposition. In 2018 Pat and Ward clock up their 60th wedding anniversary. Now that’s a Fitzroy achievement we’ll all celebrate. At Pat and Ward Leydon's 50th wedding anniversay celebration, Fitzroy memorabilia takes pride of place alongside Pat's wedding gown.